3 bedrooms, 3 bath house in 24/7 Gated Beach Resort Community! Panoramic views over the 9th hole of the Championship 18 hole Las Caras De Mexico Golf course will greet you from the comfort of the patio. With two free daily golf passes you can be on the fairway in no time! The house is a stones throw from the Pavilion Clubhouse, which features an up scale dining establishment, as well as golf cart and equipment rentals. For added comfort you can head over to the stunning La Ventana del Mar Resort pool, with special pools for young children as well as full showers and a well stocked bar. A short half-mile walk will take you to the beautiful resort beach where you can pick shells by the bucket. The house is equipped with wireless Internet, so there is no need to leave the comforts of your cozy abode to check your emails. If you like, you can take a short 10 minute drive down to the little fishing village of San Felipe and explore. The village has many restaurants and shops and is well known for their fresh seafood and authentic Mexican cuisine. The Town also features a well-stocked grocery store and many options for entertainment. Our Home has two master suites, one upstairs and one downstairs, as well as a third bedroom with twin beds for the kids! The main living area has two comfy leather couches to welcome you after a full day at the beach. This home is fully equipped with a first class kitchen. Dine either in or out or simply sip a cool drink on the roof top deck. Home also has an Queen Aero Bed for surprise guests. Play golf, tennis, pickle ball, water volleyball.... go clamming, fishing, horseback riding, relax at the hot springs or just chill napping on the clean soft sandy beach! This is the rainbow to your pot of gold. Master and Jr. Suites include double sinks with large closets and plenty of room. Bathroom off the twin bedroom is single sink with walk-in shower. Plenty of parking in the outside area. House located at end of street with no houses around. Bring it all down and have some fun. Full internet no downloading or streaming. Full kitchen with everything you need. Dining with amazing views for four along with a kitchen bar that seats 4 as well. From satellite tv music channel. Plenty of beach pails for picking up shells. House off the beach for complete privacy on a beautiful golf course. No neighbors around. This is our second time staying at Karol's place in El Dorado Ranch. We had a great time and look forward to returning again. Cesar, the property manager, was very helpful in getting pool and gold passes and answering any questions we had. Thank you so much! The house was very spacious & comfortable, the beds were very comfy, very nice bathrooms ( although shower heads were partly plugged & needed maintenance), plenty of cooking utensils & dishes, awesome patio & rooftop space for lounging. awe had a great time thank you very much. Thank you for staying at our home. I am happy you enjoyed your visit. I apologize for the shower heads, I will make sure they are taken care of. Next visit, please feel free to let us know, while you are there, so we can send someone over to replace them. My family and I loved our stay in San Felipe and this house was one of the main reasons why. The owner paid close attention to details making sure it was nicely decorated and provided all the necessary amenities. The kitchen had all the utensils and appliances needed for cooking and they had every type of coffee making device you could ever need (pod-coffee maker, french press, standard drip, etc). Tina and Alfonso were very helpful in getting us all the information we needed and even sent info on where to shop and what beaches to visit when we asked. Alfonso also came to the house when we needed help with something. They went above and beyond. The picture of the house does not do it justice since it has since been landscaped. It is beautiful. We will definitely be back! Thank you for your kind words :) You and your family were wonderful and we hope to see you again soon! 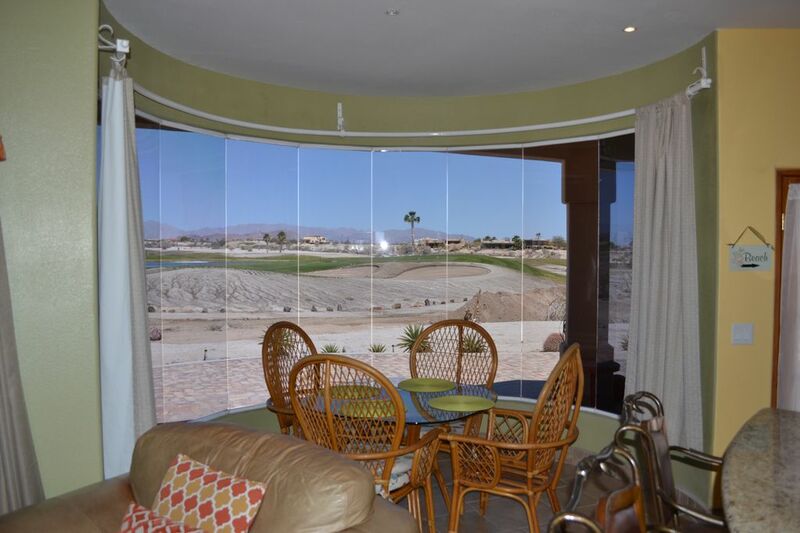 Upon arriving to this rental, I was instantly impressed by the stunning views of the golf course and mountain ranges behind the property. The massive window in the dining area was definitely one of my favorite parts of the home. We enjoyed watching the sunrise from the roof and the walk to the beach every morning. The home itself was very clean and tidy upon arrival, towels and blankets were all freshly folded and washed. The location of the rental is peaceful and had plenty of parking out front. We had no problems navigating to the stores and restaurants down the road for food. Overall, this rental was incredibly perfect for unwinding and relaxing on our Christmas getaway! Thank you for spending your holiday in our amazing home. I am so glad you enjoyed your stay. Hope you return soon.